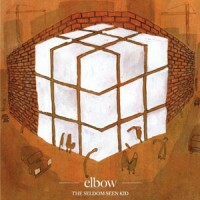 Their fourth studio album, "The Seldom Seen Kid" is a welcome return from the band, driven by a thunderous riff that reminds listeners of Elbow's love of the heavy as well as the delicate. Produced by keyboard player, Craig Potter, the album is the follow up to 2005's universally acclaimed "Leaders Of The Free World". The lyrical core of "The Seldom Seen Kid" sees Guy Garvey address the key questions of life. Over the 11 tracks the big themes of love and loss become the central focus of an album that sees Elbow, a band universally recognised for their musical ability and innovation, stretch their sonic template further than ever before. We move from the sparse electronica of "Starlings" through the flamenco influenced "The Bones Of You" to the Zeppelin-esque rock of first single "Grounds For Divorce". They even make space for a song described as " a Bond theme, if Bond were from Bury"(!) and a duet with the brilliant Richard Hawley. Blending the intimate with the epic, this could be their best record yet!